There are probably already a million and one pumpkin puree recipes posted on the Internet, sharing step by step how to make pumpkin puree. But given the season, I don’t think my 31 Days of Homemade series would be the same without it. 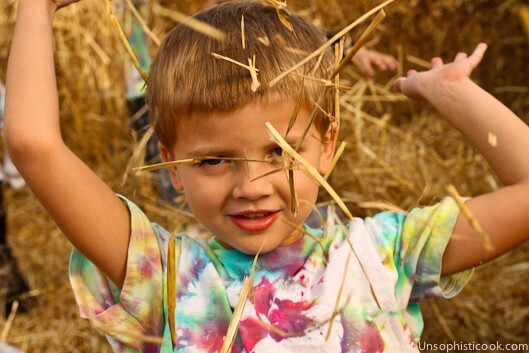 And hair full of hay… Ah, to be four years old again! After finally wrangling my little one away from the Autumn wonderland, we brought our little handpicked batch of pumpkins home. Some went on our front porch as decorations for now, to be pureed later, and others met the knife this afternoon. We washed and dried them thoroughly. Then we sliced them in half, and scooped out the seeds and stringy flesh. I trimmed off the stems to allow the pumpkins to fit on my baking sheet better and placed them cut side down on the rimmed sheet. Then I poured about a cup of water around them. Into the oven they went for 60 minutes, until they were soft and easily scooped out of their skins. 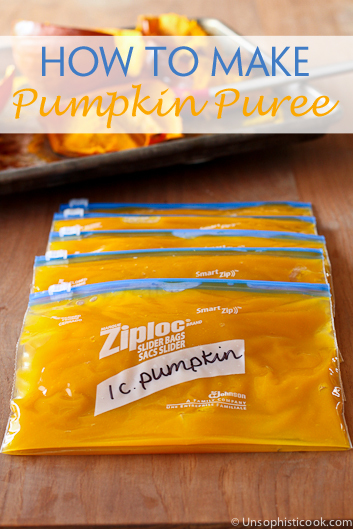 I then pureed the pulp with my trusty Breville Control Grip Immersion Blender, divided the puree up into one-cup portions, and placed each portion in a Ziploc bag to freeze for all kinds of yummy Fall treats! I know it’s pretty darn simple, but it tastes infinitely better than canned! If you prefer the thicker consistency of canned pumpkin puree, you can strain some of the water off by placing the puree in a cheesecloth-lined sieve to drain for about 30 minutes before using or freezing. But I use it in my favorite pumpkin recipes, like pumpkin bread and pumpkin pie, as is. 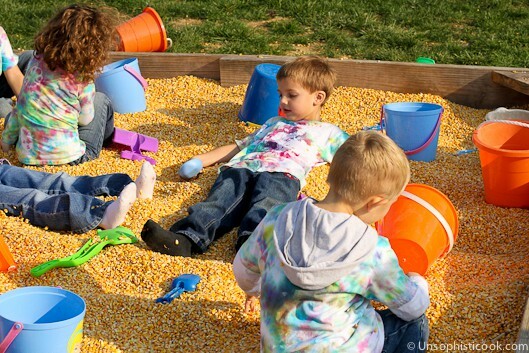 Wash and thoroughly dry your pumpkins. Slice in half and scoop out the stringy flesh and seeds. Trim the stems off and lay cut side down on a baking sheet. Pour about one cup of water around the pumpkins and bake at 350 degrees for approximately one hour, until the flesh is soft and can be scooped out easily. Scoop out pumpkin pulp and place in a large bowl to puree with an immersion blender. You could also transfer it in batched to a food processor to puree. If your pumpkin puree is too thin, you can strain off some of the water by lining a sieve with cheesecloth and transferring the puree to it for about 20 minutes. The three little pumpkins that I pureed today produced about 5 cups of pumpkin puree. The puree should keep for up to a year in the freezer, but I’m sure mine will be gone long before then! Hey! All I have is a hand wand mixer, will that work or should i just mash down with a fork? Hi Lora! Do you have a blender? That would work, too. If not, you can use your hand mixer. Your puree just might be a little chunkier, but it will still taste great. I got some of the bigger pumpkins for free at the market after Halloween. I can’t wait to try this. 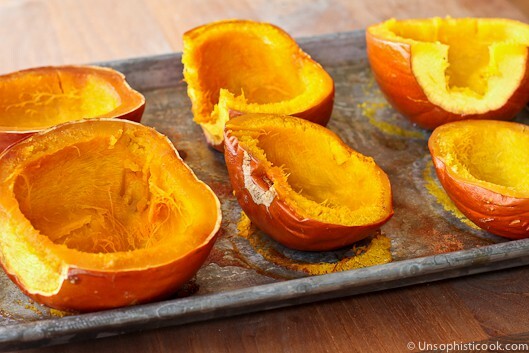 When the recipe calls for the canned pumpkin would you substitute with 1 cup of the puree? Hi, Tia! 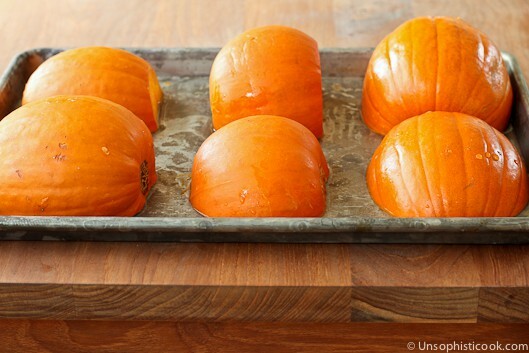 Yes, you can substitute it 1:1 for canned pumpkin in your favorite recipes. Hello. I’d like to try tour pumpkin puree recipe this weekend,but I have one question. Which degrees you have used? Thank you a lot. Oven temperature is 350 degrees F. About 175 Degrees C. It is listed in the recipe in the box under the pictures. Hi I am new to your site/blog and love it! I noticed on this recipe you mentioned to use “pie pumpkins” and am wondering is there a difference? My daughter bought pumpkins and am wondering if they will work as I would hate to throw them out if I can use them for something yummy like this! 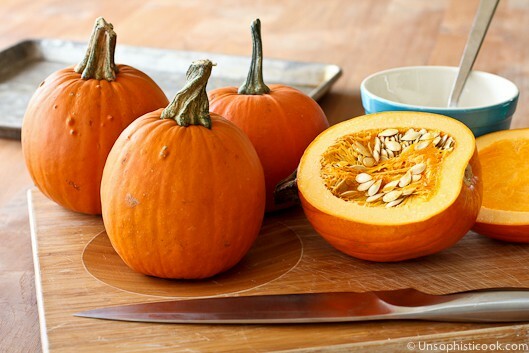 Im wondering do you have any other recipes which use cooked pumpkin as an ingredient? Ive seen savory dishes such as sauces and such but wondering if you have any you like! I wante you to know that you can also use full size pumpkins for this, just as yummy just a little more work. Keep the pumpkin recipes coming! Love this! I have made my own pumpkin purée for the last few years and love the taste over the canned stuff. My method is similar to what you described but I didn’t add the water, I plan to try it when I bake my pie pumpkin today. this looks great! time to go pumpkin picking! Great post and pics! I hate canned pumpkin puree, it has a metallic taste to me. I love homemade pumpkin puree! 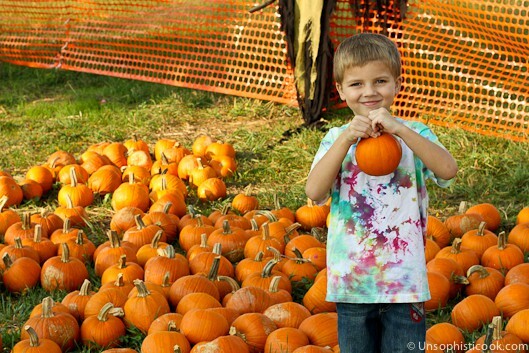 I grabbed some pie pumpkins last night and planning to make some puree today. Great post, Tara! What a great idea! I can imagine that it’s tons better than the canned stuff.